One cannot find a greater act of forgiveness than these words spoken by Jesus as he is nailed to his cross. Only Luke (23:34b) tells us that Jesus spoke these words, and some of the very earliest copies of Luke do not contain this verse, including Papyrus 75 (the earliest text of Luke) and Codex Vaticanus (the earliest copy of the complete New Testament). It looks to me like some early Christians could not believe that Jesus would absolve his killers. In their vengeful desire to see the leaders of Israel suffer for their sin, these early Christians proved to be less merciful than the One who suffered the pain of the nails in his hands. Peter reaffirms that what Jesus said was true. 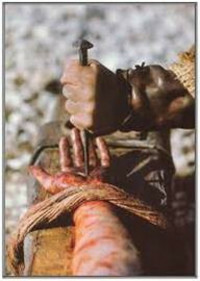 No one who was there that Friday knew what they were doing when they condemned Jesus to the cross. They didn’t realize that this prophet from Nazareth was God in human flesh. If they had, they would have fallen at his feet. They would have shrunk back in horror at the thought of ever laying violent hands on him. How else do we explain the amazing flip-flop of the adoring crowds who turned from crying “Hosanna!” on Palm Sunday to crying “Crucify him!” on Good Friday? You say it was a different crowd? You say the chief priests hired a Rent-a-Mob to demand a death penalty on Jesus? True. But I suspect that a lot of the people in that Rent-a-Mob on Friday were also in that Palm Sunday parade. The crowds got it wrong both times who Jesus was. They mistakenly thought he was their revolutionary leader who would drive out the Romans. But they also failed to understand that he was Someone far greater, that he was the Lord of heaven and earth, the ultimate Undercover Boss. So in an incredible twist unprecedented on any episode of “Undercover Boss”, they crucified him. God does not hold this sin against those who were directly involved in the crime, because at the time, they acted in ignorance. One could say that you and I today know too much to claim ignorance. We know who Jesus is too well to reject Him without serious consequences. Jesus compares Sodom and Gomorrah to the towns that heard him speak face-to-face. The Jews thought that Sodom had no share in the world to come. But Jesus says, “It shall be more tolerable on the day of judgment for Sodom and Gomorrah than for you.” Sodom never had the privilege of having the Savior himself walk in their streets. The people of Galilee were without excuse. And we have even less excuse than they had. We have no excuse to ignore or say No to God’s incredible mercy. We can’t claim we haven’t heard. We can’t claim that we had no chance to respond. If we end this life separated from God, we have no one to blame but ourselves. How can people reject the grace of God, when God has done so much to save us? Maybe it’s because, despite how well-informed we are, we still don’t know what we’re doing when we throw the undeserved kindness of God back in God’s face. Jesus tasted all the pain of hell, so that we would never have to go there. When we reject or despise the saving kindness of God, when we think we can save ourselves by our own goodness, or when we imagine that God would never send anyone to hell because we think God is too weak or too kind to do such a thing, we know not what we do. In fact, one could say that whenever we sin, we know not what we do. When we fail to exercise self-control of our desires, do we realize that we are allowing ourselves to be enslaved by destructive forces? When we fail to tell the truth, do we realize that we are undermining our credibility? When we harbor hatred in our hearts, do we realize that we are only hurting ourselves? When we are driven by an insatiable desire to enjoy and acquire more and more, do we realize the Bible calls this a form of idol-worship? When we sin with the cynical excuse that Jesus already paid the price for our sin, do we realize the Bible calls this crucifying the Son of God on our own account and holding him up to public contempt? (Hebrews 6:4) When we sin, do we stop to think that it was those very sins that made it necessary for our Lord to be nailed to that cross? Long before we were even born, Jesus knew what we would do. He knew that we were acting in ignorance. And yet, he willingly gave his life to take away all of our sin. But Jesus is not content for us to stay in ignorance. We need to wake up to what we’re doing when we sin, or when we reject the gracious mercy of God. We can’t reject that gift without serious, even eternal consequences. When it comes to whether or not we have heard the saving message of the cross, or whether we know who Jesus is, none of us can claim ignorance. So now you know. Yes, we will quickly forget, again and again. But at least now Jesus has blown the cover off of our blissful ignorance. Knowing what we know now should drive us humbly to Jesus’ cross, to the one fountain of mercy for the entire universe. Knowing what we are doing, to the extent that God opens our eyes to see, should bring us back again and again to Jesus’ cross.